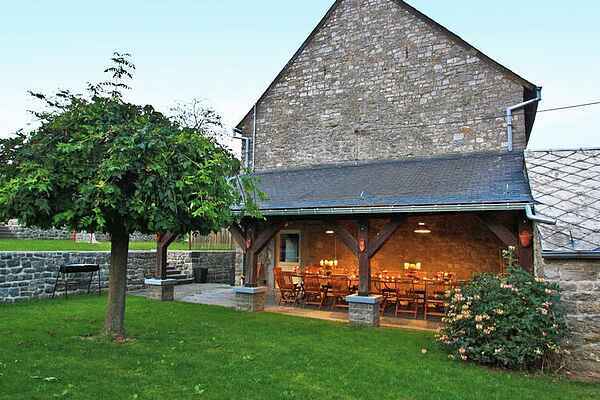 This holiday home is a beautiful historic stone building located in the small village of Gerin, near the fortress town of Dinant and Maredsous Abbey. The house is fully restored retaining the charm of yesteryear and some original features, including doors and the oak staircase. In the cozy living room the fireplace creates extra ambience during colder days. The children will have fun in the playroom or play a game of foosball in the recreation room. But the fully enclosed garden with various levels is also a good place to be. Enjoy the covered terrace views and a delicious barbecue while the children have fun on the football field. This holiday home is only suitable for families. In the immediate vicinity you can take beautiful walks and bike rides. Would you like some action? Then descend the Lesse river in a kayak. Nice spots to visit in the area include the Abbey of Maredret, Maredsous Abbey, the Annevoie gardens and the ruins of Montaigle. And you shouldn't miss a visit to Dinant (8 km) , with its beautiful citadel. Golf enthusiasts can hit a ball on the golf course of Rougemont.